1.It’s Father’s Day, so here’s a shout out to my dad. I totally start almost every Friday night by calling my father in North Carolina so he can read me an Uncle Wiggly story like he did when I was a little girl. My favorite is Uncle Wiggly and the Wolf! 2.When I lived in New Orleans, I once participated in a real voodoo ceremony and had my hair washed with rum, Florida water, and cake by a mambo. 3.The reason I make actor Stuart Townsend the inspiration for my wolf shifter character Liam Murphy and my vampire character Andre is because I once met him in California when I was on a wine tasting tour of Sonoma and decided he was the most gorgeous man alive. I was too tongue tied to say anything but a stammered hello as he passed by. But BONUS –he said hello back! 4.The vampires in my novel Blood Gift have the Nordic rune Gebo on their backs to signify they belong to the London Circle. So do I. 5.Once I rented a house in New Orleans and when I was setting up the bedroom, a Voice in my head warned me to never leave a candle unattended on my nightstand. I listened for two years until one Friday night when I thought, I’ll just be gone for five minutes getting pizza out of the oven. When I came back, the room was in flames and the fire department later determined the fire originated on the nightstand. #4 Tell us more! How interesting. I found this - GEBO = the rune of love and forgiveness. How lovely. #5 Now, that is creepy. Do you believe in spirits then? I've heard so many of these great stories - of guardian angels helping us Earth-bound. Anyone else have a great story like this? Miss Amy Lee Burgess, S'more extraordinaire, will be giving away a free copy of BLOOD GIFT to the first person who guesses the FAKE FACT. Go on then! I love divination systems like the runes, Tarot, and the Celtic ogham. Back when I was writing the first incarnation of the vampire novel, I was very into runes. So I chose one for their mark. Gebo means "the gift". (Another reason for the title of the book too!) 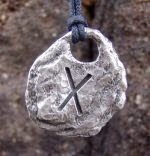 It's an exchange of power and emotion between people - usually male/female - which makes it a pretty sexually charged rune. And thus, very fitting for my vampires! Why do I have the same mark in the same place as they do? Well, let's just say I got divorced. Ever hear of divorce tattoos? I think Gebo is a very fine divorce tattoo! LOL! The voodoo ceremony took place at St. John's Bayou in New Orleans and it was a dream the future ceremony. So after my hair was washed with cake, rum, and Florida water, the mambo tied my hair up in white bandanna and I had to SLEEP with it on so I would have prophetic dreams. I'm not saying if I dreamed of Stuart Townsend, but come to think of it, it was only a couple months later that I met him! Miss Amy Lee, it is ALL my pleasure, what an interesting path you have taken, and I am so impressed with what you will go through to research for your books. I reckon that is a huge part of you as a storyteller. You are right in learning to trust our intuition. I, too, am still learning to listen to my inner voice. But I definitely believe it is there! I love that you talk to your dad every Friday. What a great tradition. All of your answers seem like they are possible, so I'm going to guess that #4 isn't true. But it would be cool have a similar tattoo to one of your characters in your story. Thanks for popping by Miss Gemma! I wholeheartedly agree, what a wonderful Dad. Makes me a bit teary-eyed thinking of it today. I think if #3 were true, I'd have heard about it LOOOONNNNNGGGG before now. Haha! So yeah, #3 is the fib. Okay, Stacy. You got me. I never have met Stuart. *pouts*. But even if I had, I wouldn't necessarily shout about it. I'm shy about things like that! Since you already have Blood Gift, would you like a copy of Blood Gate, the sequel, when it comes out iin August instead? Not shout about it? You made me laugh. I might not know you that well, but I think I know you enough to know you'd be plastering that news all over the S&S page, especially whenever you posted his picture! And since you insist I'm the winner, yep, I'd be honored to get a copy of Blood Gate (for Nook, right??). A voice in my head is telling me that #1 is not true. I might get boo'd for this, but I can't ignore the voice. LOL. Unofficially, I'm with Krissy. But since she's already taken it and Gemma and Stacy have 3 and 4, I'm going with 5. I really hope you didn't have a fire, Amy! We had one growing up and although it was memorable, it wasn't exactly a barrel of fun. Fascinating facts, though! I can't wait to find out who's right! I know voodoo, crazy, but how better to write about something than to actually do it yourself? She's got the right idea! Wow. One of you is right and many of you ought to listen to your inner voices. A couple of you already have my book and one of you who does guessed right. So now is the time for someone who doesn't have my book to guess. I really want to give it away! LOL!